Does Rossi have what it takes to take his second win of 2013? Statistically, Valentino Rossi is the second-most successful rider to compete in Grand Prix motorcycle racing. While Giacomo Agostini racked up 15 titles, Rossi is more than halfway there, having lobbed 9 titles of his own. Of course, of Ago's 15 titles, 8 have been won in the premier class of motorcycle racing - at that time the 500cc class. Of Rossi's 9 titles, 7 have been won in the premier class of motorcycle racing (the first of which was won in the 500cc class, while the rest were won in the MotoGP class). 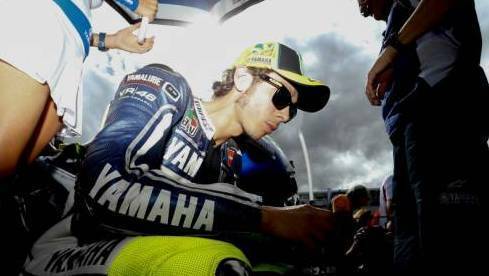 Can Rossi take another win this year at Sepang? Of his 198 starts in MotoGP, just ahead of the 2013 Malaysian GP, Rossi has won 67 races. And of his 32 starts in the 500cc class, the good Doctor has recorded 13 wins. Which means he has an average winning rate of approximately 35 per cent. Prior to that ill-fated move to the Ducati team in 2011, Rossi had taken a total of 181 race starts and won 66 of those races, leading to a winning rate of 36 percent. Post the start of the 2011 season, though, Rossi has started 49 races. Of these, he's won just once. Which means his win rate is down to 2 per cent. Not something the charismatic Italian rider will be too pleased about. But what do Rossi's chances look like at the 2013 Malaysian Grand Prix? Well, let's just take a look at Rossi's history at Sepang. Of the 12 races he's started at Sepang (we'll discount the 2011 race that was cancelled due to Marco Simoncelli's death) Rossi's finished 11 times, only retiring once. He has finished no lower than fifth at the event, and has made his way onto the podium a total of 9 times. Of these, he's managed to win the race 6 times, the last time being in 2010, which was incidentally his last win in MotoGP for a good two years. Assen, this year, was when he broke the long winless streak. Qualifying at Sepang, however, saw Rossi make his way to the front row for the first time in all of 2013. A front row start could well give him a chance at another win. The only trouble is that starting ahead of him is Marc Marquez, the blindingly-quick rookie who currently leads the MotoGP standings. If Rossi is able to hold on to Marquez, and prevent the likes of Cal Crutchlow and Jorge Lorenzo from making their way past him at the start, Rossi's Sepang magic could kick in. We're hoping for the best for the Doctor.